Actress Han Ga In is putting in 100% into acting for MBC TV Wednesday and Thursday drama The Moon Embracing the Sun. In the drama, the mysterious shaman Won played by Han Ga In, was caught into the palace as the shaman who serves as good luck charm. In the process, in order to catch the Wol who is playing by Han Ga In, the gang of astronomy master tracked Wol covertly, and finally kidnapped her to palace. Wol who is help in the palace was even slapped in the face by state shaman of Seongsucheong, experiencing the viscous palace entering ceremony. But her misfortune does not stop here. In episode 9 of The Moon Embracing the Sun broadcast on February 1st, 2012, Wol becomes the shaman that adsorbs the unluckiness after the projection of Yoon Dae Hyung, but Lee Hwon misunderstands that she deliberately gets close to him, and locks her inside the secret prison of Seongsucheong. In the prison, Won is facing the crisis of been branded with words on her forehead and expelled from palace. Han Ga In who is held in an abandoned prison, is in sad and despair state due to the fear and anxiety in the heart, and the refusal of Lee Hwon towards her, her delicate emotional changes become more mature. Especially Han Ga-in is not only been locked up, gets a slap in the face, but also faces the danger of forehead branded with words. Han Ga In is playing the role Wol sternly without fear, leading the the applauses by the crews. 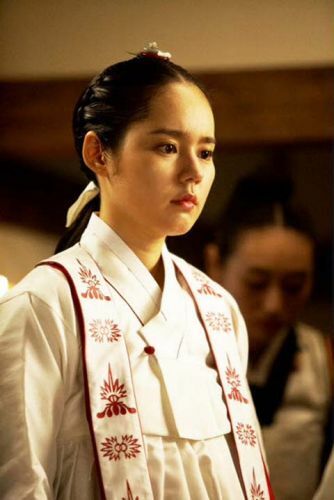 The suffering history of Han Ga In is broadcast on episode 9 of The Moon Embracing the Sun broadcast on February 1st, 2012.